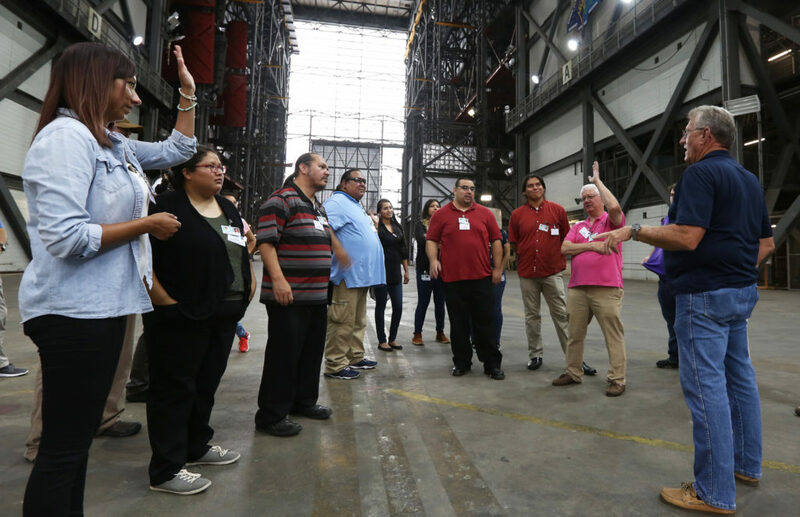 First Nations Launch Competition Winners tour the Vehicle Assembly Building at NASA’s Kennedy Space Center in Florida. A group of 15 college students recently visited NASA’s Kennedy Space Center as winners of the First Nations Launch competition in Wisconsin. They were part of teams that successfully flew high-powered rockets, earning them an opportunity to visit the Florida spaceport. The competition is supported by NASA and the Wisconsin Space Grant Consortium. It provides an opportunity for students attending tribal colleges and universities or who are members of a campus American Indian Science and Engineering Society, or AISES, chapter to design, build and launch a rocket at a competition in Kansasville, Wisconsin. During the students’ visit to Kennedy, they toured the Vehicle Assembly Building, Launch Control Center, Swamp Works, Kennedy Prototype Shop, Cryogenics Lab and the visitor complex. They also were given the opportunity to participate in a panel discussion on career opportunities with NASA, contractors or other areas of the aerospace industry. Christian Cultee participated as a student at Northwest Indian College established by the Lummi Nation in Bellingham, Washington. He noted that his visit was one he would not soon forget. While competitors usually are majoring in engineering disciplines, Cannon noted that that’s not always the case. There are two annual challenges students may choose to enter. In this year’s Tribal Challenge, a rocket is launched and is judged on its stability using a small onboard camera. In the AISES Challenge, student teams from AISES chapters design, build and launch a rocket that will be able to provide an active drag system integrated into the rocket by means of a mechanical device. The goal is to attain an altitude of exactly 75 percent of the nondeployed drag system to the altitude of the first launch.